…why is there a section smack dab in the middle of the Dog Breed Info Center® website on Spike the Bulldog? Well folks, this is where it all began. 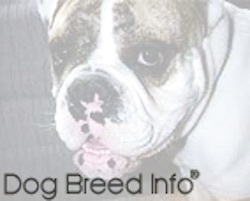 That's right, the entire Dog Breed Info Center® website started off as a small site about Spike the Bulldog. Back in 1997 I received my first Windows 95 computer. After a month or so I decided to hook up to the Internet. I ended up signing a three-year contract with Erol’s Internet. With the package came one free megabyte of web space. At the time I had no idea what web space meant, let alone a megabyte of it. While explaining to my brother how I signed up for the Internet, I mentioned the web space. He asked "What are you going to do with the free web space?" I responded "What IS a megabyte of web space??" He briefly explained and told me to pick a subject. He'd be over later that week to show me what it was. I decided to do a blurb on who else but Spike the Bulldog. The feedback from people who enjoyed Spikes pages was intriguing. After saying all there pretty much was to say about the crazy Bulldog, and realizing how fun it was to build websites, at 2 o'clock in the morning I decided I was going to build a page on every breed and type of dog in the world. I was told by another popular dog website I was wasting my time. There were loads of dog information sites out there. I considered what they said for a split second; after all I could not even type one iota, and in the very next second decided if there are loads of dog info sites out there, what will one more hurt?! And so it began…one finger at a time. I would like to personally thank my brother Ralph and my brother-in-law Paul for all they have taught me and done for the site. Could not have done it all without them. And of course, Spike the Bulldog.